(March 27): Most Southeast Asian stock markets ended lower on Monday, as U.S. President Donald Trump's defeat on a crucial healthcare bill fanned concerns about his ability to push through tax cuts and fiscal spending to boost economic growth. Trump suffered a stunning political setback on Friday in a Congress controlled by his own party, when Republican leaders pulled legislation to overhaul the healthcare system, a major 2016 election campaign promise of the president and his allies. His failure to get enough support to "repeal and replace" the Obamacare health insurance reforms has raised questions about the Republican Party's capacity to govern effectively. "The failure of the Trump government — the push for their own healthcare — has resulted in mixed results in the regional markets today," said Manny Cruz, an analyst with Manila-based Asiasec Equities Inc.
"So, we are waiting for some developments before moving back to these markets." The political setback in the United States spurred a rush to safe-haven assets such as gold. Gold rose more than 1% to a one-month high, after the dollar plunged. 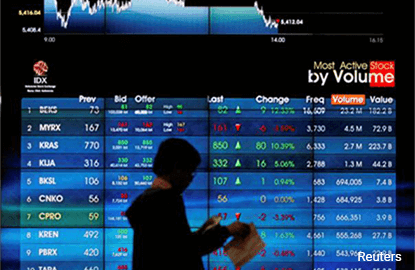 In Asia, MSCI's broadest index of Asia-Pacific shares outside Japan fell as much as 0.3%. Singapore shares ended 0.5% lower, snapping two sessions of gains, with real estate and industrial stocks leading the losses. Real estate company CapitaLand Ltd and Jardine Cycle & Carriage Ltd shed 1.4% and 0.6%, respectively. Philippine shares closed 0.3% lower, weighed down by industrial and financial stocks. SM Investments Corp declined 1.1%, while Metropolitan Bank & Trust Company fell 3.1%. Indonesia finished the session 0.5% lower, with financials accounting for more than half the losses. the biggest percentage gainer with a rise of 1.3%.